Every time I see a photographer using an old film camera it makes me smile. It doesn’t happen often – seeing a film camera that is, not smiling – but it does make me wonder about their reasons. The love of the art of photography perhaps, or maybe they’re after some ‘feel’ to the image without reverting to Photoshop? Perhaps one day I should stop and ask. Film cameras are, of course, extremely limited when compared to the capabilities of today’s DSLRs in virtually every respect. Except one: they don’t need to be constantly fed power. Of course, depending upon the style of photography you pursue power may not be an issue. 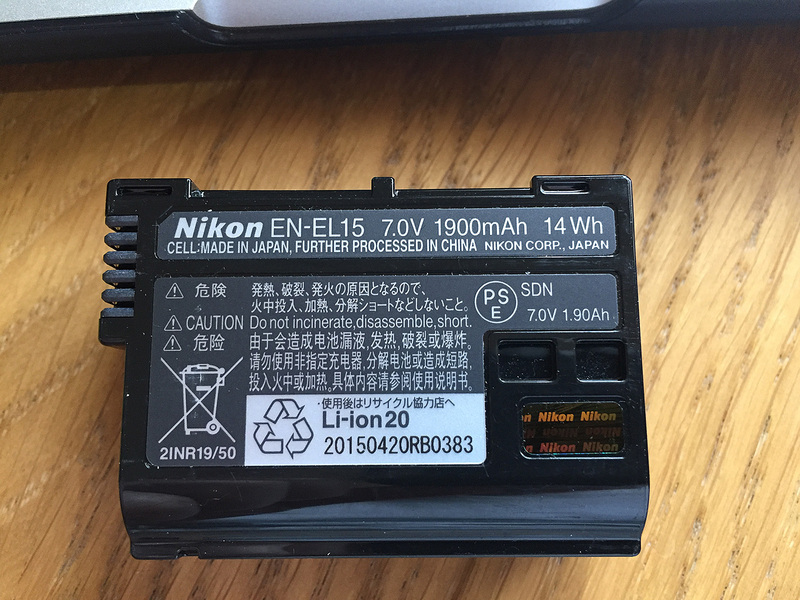 A healthy DSLR battery in normal conditions can usually cope with 700-1000 shutter operations and as long as you don’t make heavy use of live view, picture review or image stabilisation then a single battery may easily cope with a day’s shooting. Carry a spare or two and charge them back in the hotel room overnight and power will not be on your shoot’s “risk register”. But what if you don’t have a room to go back to – have no mains power at all? What if you do need to shoot video, use live view and stabilisation? What if you are not shooting in ‘normal’ conditions? How do you keep a ready supply of power then? Power on location has become a bit of a crusade for me and I have written about it before when first looking at the Voltaic Systems’ Solar Charger and in my detailed Voltaic Systems’ 17W Solar Charger Field Review. But as I prepare for two upcoming trips – the uninhabited island of Batu Tara, Indonesia and central Siberia – I’ve been spending more time researching my holy grail – a reliable, capable, easily transportable power source. And I have learnt some interesting facts which may be worth sharing as they help demystify the confusing world choosing a battery pack. Whilst this article does have a slight photographic angle it is equally applicable to choosing a battery pack for any purpose. My two primary use cases for power on location; charging the laptop and charging my camera batteries. Perhaps obvious but worth mentioning is that what you want to keep powered on location will dictate the kind of solution you will need. Before travelling to Ethiopia I knew that I wanted to be able to charge not only my DSLR batteries but also my travel laptop and so the solution that I needed had to have the ability to provide 12V for the DSLR and 16V for the laptop. But once on location other requirements were discovered; my smart phone (for quick videos) and someone’s drone batteries, meaning that the more standard 5V USB port was needed. Given that most battery packs are USB only I could eliminate a lot of options very quickly. If you have ever looked at battery packs on Amazon or similar web sites you’ll notice that they are almost always rated by their “mAh” or milliampre-hour value and it is human nature to assume that the bigger the mAh, the more you can charge with the battery pack. And if you are only looking at charging USB devices then you would be right. Well, that 26000mAh battery pack still won’t really be 26000mAH, but at least it will still be more than the 20000mAh one – which will also not really be 20000mAh. But, if you are looking at charging more than USB devices, for example camera batteries and laptops, mAh suddenly becomes far less useful and even downright misleading. Equations tend to put people off, as does talking about current, volts and watts so a typical analogy may help: a garden watering can. Every watering can has a capacity – it may be large or small but it can only hold a finite amount of water. In the same fashion a battery pack has a finite capacity for storing electricity. The capacity of a watering can is usually measured in litres (or pints); the capacity of a battery pack is measured in watts (W), or more specifically watt-hours (Wh). The flow rate at which the water leaves the watering can’s spout represents electrical current. If you were to fill a cup from the watering can, it would take a long time if the water only dripped out but be very quick if the water gushed out. In the same way, electrical circuits require an amount of power to be supplied to them; just how much is their flow rate and delicate electronics usually require very low flow rates. The battery pack’s flow rate is termed its “current” and is measured in ampres per hour (Ah), or thousandths of an ampre per hour – mAh. Voltage is a like the force or pressure of the flowing water. Imagine water pouring out of the watering can’s spout onto the earth. If the spout is simply the open end of a tube then the water is concentrated in one spot and it hits the earth with some force likely pushing the earth aside making a small hole. If you attach a sprinkler head to the water spout the water is spread over a larger area and it hits the earth with less force. In the same way a lot of water in one spot can make a dent in the ground, too much voltage can damage electrical circuits. Ultimately what is important to us is the capacity of the battery pack as this directly determines just how much stored power we have for charging our camera batteries, phones, drones and laptops. And, as mentioned, stored power is measured in watt-hours. So when choosing a battery pack the value we are really interested in is not amps or millamps, but watts. Now I promise this is the last of the watering can analogy. A full can could be emptied in one go or gently poured out – in other words how long the stored water lasts depends upon how quickly you use it. Power stored in battery packs is usually given in watt hours (Wh) meaning a 72Wh battery can provide 72 watts for one hour, 144 watts for 30 minutes or 1 watt for 72 hours. So how long it lasts depends upon how much power the connected device is using and that is a function of the voltage the device requires and the current it is drawing. In the same way that watts can be expressed as watts per hour, amps can be expressed as amps per hours. So 10000mAh means that over a one-hour period 10 amps will flow; equivalent to five amps per hour for two hours and so on. But there is one crucial difference between watt-hours and ampre-hours: ampre-hours only measure the flow of power, not how much power has flowed. Knowing the mAh rating is all well and good but it does not tell us the actual capacity of the battery. So, why then, when shopping for battery packs do manufacturers almost always rate their products in amps? The best way to demonstrate why using the mAh can be misleading is by an example. I have picked the Maxoak battery pack below only because it is in my Amazon shopping basket and it actually – if perhaps inadvertently – attempts to be somewhat honest about the battery’s true capacity. Some battery pack manufacturers provide the watt-hour capacity of their product which is much more useful than the mAh value. The obvious selling point of this battery pack is its 50,000mAh rating. If you were looking for a high capacity pack, this would be very hard to ignore. My Macbook Retina Pro 13” laptop has a rating of 6559mAh so in theory I can charge it about eight times from this battery pack. The maths is simple but do you really believe the result? From the equation above we know that the actual capacity of a battery is the current – here 50 amps – multiplied by the voltage. The problem is this battery pack lists three voltages, so which one do we use? So, where did 3.7V come from? 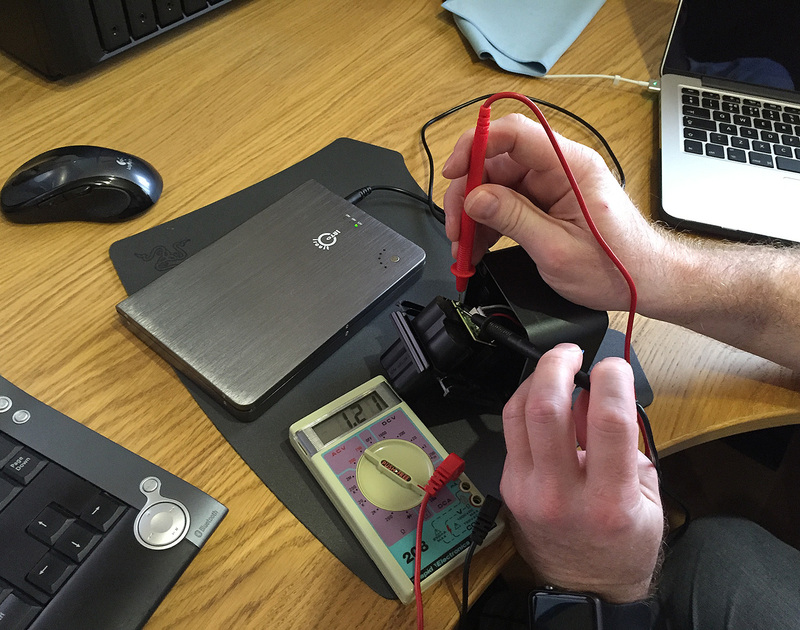 The advertised voltages are 5V, 12V and 20V. Something does not add up. A “cell” is a basic electrochemical unit that contains the basic components, such as electrodes, separator, and electrolyte. In the case of lithium-ion cells, this is the single cylindrical, prismatic or pouch unit, that provides an average potential difference at its terminals of 3.7 V for LiCoO and 3.3 V for LiFePO. A “battery” or “battery pack” is a collection of cells or cell assemblies which are ready for use, as it contains an appropriate housing, electrical interconnections, and possibly electronics to control and protect the cells from failure. In this regard, the simplest “battery” is a single cell with perhaps a small electronic circuit for protection. Which is a big difference. Suddenly the mAh figure used by so many battery pack manufacturers is a little less meaningful as it depends upon the voltage requirement of the device being powered. What the manufacturer is doing is stating the theoretical current output of their battery pack as if it were a single cell. This is called Single Cell Equivalency, or simply SCE, and is very common. Unless a manufacturer of a battery pack states otherwise then it is probably wise to assume that the mAh value they proudly claim for their product is based upon supplying a 3.7V load – the SCE. And, given that the vast majority of battery packs aim to provide a 5V USB for phones, tablets and, well, anything else USB, then you can see that the advertised mAh value is already a little meaningless as that 20000mAh (at 3.7V) battery pack is now only 14800mAh (20Ah * 3.7V = 74Wh / 5V = 14.8Ah). Knowing about the SCE is really quite useful as it allows you to get a better idea as to the true capacity – the watt-hours – of a given battery pack. 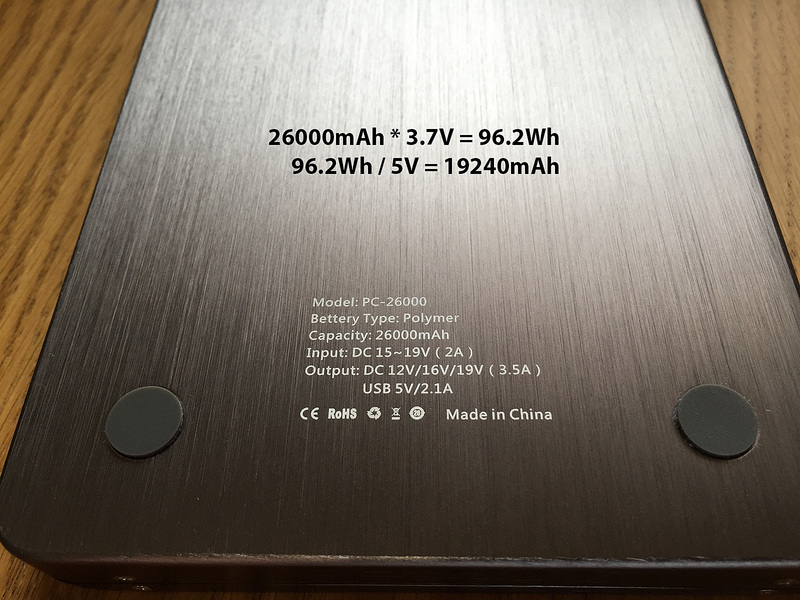 The Intocircuit battery pack specifies a ‘capacity’ of 26000mAh, but this isn’t really what you get. It is not a lie, but, like most other manufacturers, they are using an industry standard that you won’t be. Our 26000mAH pack is now only 19240mAh. But there will be energy losses due to conversion. Depending upon the internal design of the battery pack its native voltage will be a multiple of 3.7V and the process of turning the native voltage into USB’s 5V requires some kind of circuitry such as a boost convertor. This type of conversion is inefficient and whilst I have no concrete evidence I have seen a figure used in a couple of articles: 30%. If we use this figure then we get a 5V USB mAh of 13468mAH, enough to charge an iPhone 6 (SCE 1810mAh) about seven times. Going back to my Macbook and its 6559mAh capacity we now know that we really need is the watt-hours capacity of its battery which, according to Apple’s web site is 74.9Wh. Apple are helpful in that they specify the watt-hour (Wh) of their devices. The Maxoak could therefore theoretically charge the MacBook twice with a bit left over, although again this is just the raw arithmetic without accounting for internal losses due to voltage conversion and other considerations. Assuming a 30% for conversion reduces this to approximately 1.7x charges for the MacBook. Here the Nikon EN-El15 specifies the watt-hour capacity from which we can calculate the single cell equivalency as 3780mAh. This is a more tricky example as, whilst the Nikon battery is a 7V battery pack the Hahnel battery charger I use for it specifies a 12V input. But I was curious to find out anyway. So what does the 7V Nikon EN-EL15 battery draw when charging from a 12V Hahnel charger? 8V at 1.2 amps. apparently. If we believe the rudimentary maths my 26000mAh battery pack should charge 4.8 EN-EL15 batteries. I have so far managed just under three charges from the battery pack and there are still 2/5 LEDs lit so we might be in the right ballpark. One final note is that all the above is assuming that the environment is not a factor. If the surrounding ambient temperature is significantly higher or lower then this will also have an effect of the number of charges as it affects the battery chemistry. Remember the 50000mAh (SCE) Maxoak battery pack above? It is attractive and despite the 50000mAh not really being what we have available it is has more capacity than a 26000mAh (SCE) battery. But there is a reason it is still in my Amazon shopping basket and not in the camera bag. After a few incidents involving lithium batteries on aircraft the International Airline Travel Association – IATA have issued an advisory on the passenger transport of lithium batteries, both in cabin and hold luggage. The jist of the advisory is that the maximum capacity lithium battery that can be carried is 150Wh. The Maxoak is 185Wh. Could I get away with it? Yes, probably. Do I want to risk losing the one power source I will be depending upon when on location and nowhere near mains electricity?. No. That battery pack rated at 26000mAh (or whatever) is, unless stated otherwise, most likely the SCE value, not what you actually will get. The battery pack will also have to do some internal voltage conversion which incurs power losses due to inefficiency. The loss may be about 30%. If you want to approximate how much you can charge with a given battery pack, you will need to know its watt-hours (Wh) rating and the single cell equivalency (SCE) of both it and the device being charged. Airlines tend to follow IATA’s guidelines permitting a maximum battery capacity of 150Wh, so bigger might not be better for you. As a photographer every international destination always brings its own unique logistical challenges, but one constant amongst them all is the dread of being forced to check my cabin baggage full of valuable and delicate camera gear into the hold. Like many photographers I carry my camera gear in my cabin baggage or, more accurately, my cabin luggage is a camera bag with a minority of essentials, such as passport, ear plugs, eye mask and overnight toiletries. It represents not only a sizeable financial investment but also is the very reason I travel. It would not matter whether it was lost, damaged or stolen; all would have a disastrous impact on my trip. So it stays with me, come what may. But as any airline traveller will tell you, assuring that your cabin baggage does not get checked into the hold is a bit of a black art. But why? For as long as I can remember the cabin baggage size allowance was set at 56 x 45 x 25cm. This size was suggested by IATA, the International Air Transport Association – an association comprising the majority of the world’s commercial airlines. This was not a requirement; it was a recommendation and an effort to clarify for all parties what was permissible cabin baggage. Airlines were ultimately free to choose a maximum size allowance and whilst some did, many simply adopted the IATA recommendation. An industry for cabin baggage grew up around this recommendation including camera bags and many camera bag manufacturers help by clearly stating whether the bag meets the IATA recommendation, such as the example from Lowepro’s site below. Many manufacturers provide helpful guidance on cabin compatibility but beware, they may not be using the same standard size as your airline. The rapid rise of the “no frills” airlines – the ones that charge you for every extra, such as hold luggage – led to a rise in passengers trying to cram everything in their cabin allowance. The result was increased abuse of the cabin baggage allowance, overcrowding of the storage bins, passengers increasingly being told to check their baggage into the hold, arguments, fights and most importantly of all to the airline, delayed flights. Airlines increasingly began to impose their own, more restrictive cabin allowance resulting in cabin-compatible luggage suddenly not being as compatible as it once was. In order to bring some order to this chaos in 2015 IATA introduced an initiative (http://www.iata.org/pressroom/pr/Pages/2015-06-09-02.aspx) which initially found acceptance with airline companies to standardise a new cabin baggage size that would, at least in theory, guarantee that cabin baggage would not become hold baggage. The size, 55 x 35 x 20cm was important for two reasons. First, it meant that on aircraft with 120 seats or more every passenger could fit their cabin baggage in the overhead bins. Second, it was smaller than most airlines’ maximum cabin baggage allowance and so was pretty easy for airlines to implement. Unfortunately, the rollout of the initiative was suspended a few months later after concerns from North American airlines about it being too restrictive. Quite how they came to that conclusion is a mystery as I’ve read the initiative and it is very clear that it in no way defines a recommended maximum size – it defines a size at which a passenger could expect that, in an overcrowded aircraft their bag would not be checked into the hold, whereas a larger one might. In any event, the initiative was suspended but not before some airlines adopted it as a new maximum; again not really understanding the point that IATA was trying to address. If this were not already complex enough the US Federal Aviation Authority (FAA) have their own recommendation – 55.8cm x 36.8cm x 22.9cm and US manufacturers of cabin compliant luggage are likely to adhere to this standard before IATA. So, why is this relevant to me now? Well at least that has a simple answer: An upcoming trip sees me make part of the journey on regional ATR42 twin propeller aircraft that is going to be a lot more restrictive on cabin baggage than the international Qatar flight on the first leg of my journey. In the past I have always had a bit of stress regarding the size of my current camera backpack, but the regional flight is a clear case of having it checked into the hold. Something had to be done. Like many photographers I’ve had my fair share of camera bags. For years I was a Lowepro user and I’ve worked my way through a number of their backpacks as my kit and travel patterns changed. But more than once I have returned from a week-long trip with aching shoulders after hefting my gear around all day, every day. It seems a common problem – for me at least – with Lowepro backpacks and so it was time to change brands. Then I discovered the Think Tank Airport Accelerator v2.0 (https://www.thinktankphoto.com/) and fell in love. Capacious to the point of decadence but still within the FAA and IATA (original) recommendations at 35.6 × 52.1 × 22cm. I’ve used it for a couple of years now and find it to be extremely comfortable when hiking for long periods, even with 12kg of camera gear. The backpack straps are very well padded, the zips rugged and lockable and Think Tank’s customer service is unfailingly good. But it isn’t the perfect bag. It almost is, and maybe it once was, but as I travel to ever more remote places and airlines continue to clamp down on passengers abusing cabin baggage limits I am finding it more difficult to have that guarantee – that peace-of-mind – that I won’t be asked to check my camera gear into the hold. For although it fits within FAA and the original IATA guidelines it (1) only does so when empty and (2) they’re only guidelines, which airlines are increasingly ignoring. The Think Tank Airport Accelerator may have a depth of the FAA recommended 22.9cm but that is without the anything in the front pockets. 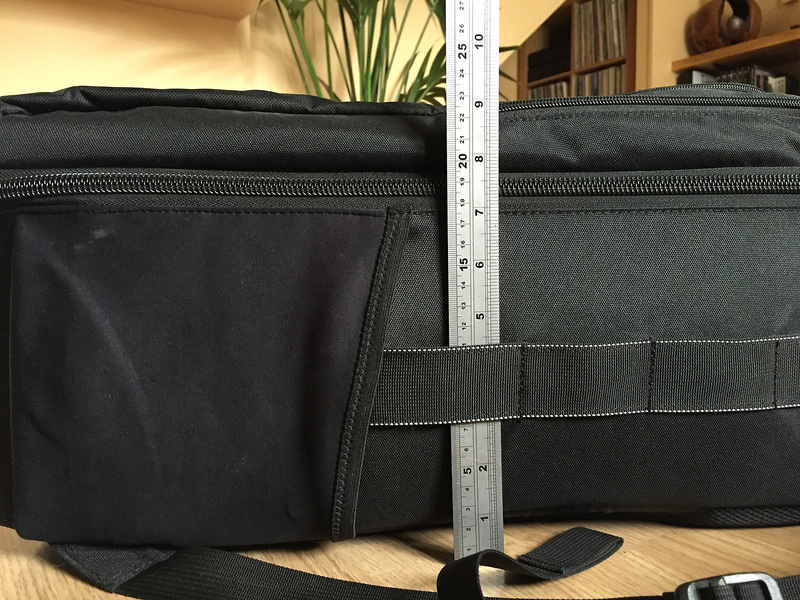 Adding another 2-3cm for a laptop makes this bag much less cabin-friendly. So began a search for a travel backpack and as I was playing ‘fantasy camera bag’ I might as well assemble my dream team of features! It had to meet IATA’s 2015 size recommendation of 55 x 35 x 20cm as this would meet pretty much any airline’s cabin baggage allowance. It had to accommodate two DSLRs each with a lens attached, specifically a D810 with 24-70 f/2.8 and a D750 with 70-200 f/4. My photography is increasingly in hostile environments – saltwater, deserts, volcanoes and snow – and changing lenses is to be avoided wherever possible. So I need to be able to swap between wide and zoom without exposing the camera sensor to contaminants. It had to be a backpack. Most of the things I photograph require a bit of a trek to get to and I want the gear strapped to my back in comfort, leaving both hands free to clamber up rocky paths and over uneven ground. It had to allow easy and fast access to all of my gear. Landscapes tend not to move that fast but in hostile environments, conditions do. The ability to pack up quickly is an important as unpacking. Think Tank were my first choice but whilst they have a smaller camera backpack that satisfies requirement (1), it definitely wasn’t not going to accommodate requirement (2). 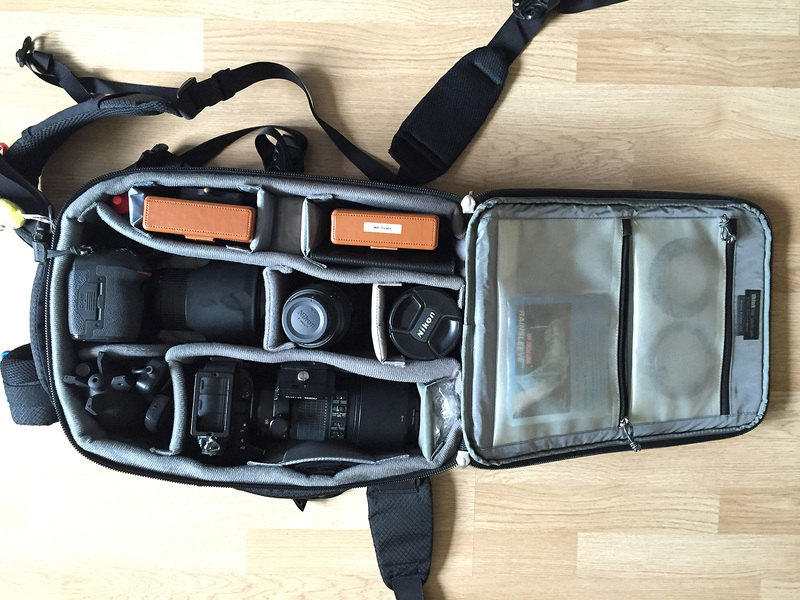 I looked at other brands – Lowepro, Gura Gear, F-stop, Tenba, Manfrotto etc. – but nothing that met my needs. Things were not looking good. Then during one of my Google searches I found the Think Tank Airport Antidote v2.0. Not listed on their web site it appears that this is an older model in their Airport series but one that showed promise. With nothing else presenting a viable option I took a gamble on a second-hand one. The difference between the Think Tank Airport Accelerator and Airport Antidote v2.0 is immediate and noticeable. The size difference is obvious. At 43 x 30 x 18 cm its external dimensions are smaller than even the most punitive airline restrictions and it even fits inside the Airport Accelerator. So, it meets requirements (1), (3) and (4) but what about the all-important requirement (2)? “Old, not obsolete.” Despite its diminutive size the Think Tank Airport Antidote v2.0 manages to fit a in impressive amount of gear without comprising ease of access. Yes, although tight I can get two DSLRs with lenses attached in the bag, along with a full complement of filters, two additional lenses, batteries and cleaning gear. Had I needed a longer zoom lens then this have been an issue but (my) photography rarely needs much above 200mm. Of course, size is only one issue when to comes to cabin baggage; the weight allowance is the other and, as any photographer will attest, your camera gear always weighs more than the allowance. I’m planning on handling this in a couple of ways. First, simple psychology. People assume that small bags are lighter than big bags so the mere fact that the Airport Antidote v2.0 is quite compact gives it a perception of lightness, especially if it looks less like a camera backpack and more like a day backpack. Coupled with the time-honoured technique of casually carrying it on only one shoulder and it shouldn’t invite a check-in or gate assistant to look more closely. There is always a chance that it might get weighed and at that point you’re pretty much stuck. One tactic is to keep an eye on the check-in queue ahead of you and, if you see cabin baggage being weight-checked it may be time to discretely get out of the queue and move to plan B. There are plenty of photographer gilets that provide innumerable pockets but they are almost universally expensive. A fisherman’s gilet will do exactly the same thing (and be much cheaper) or camera belt can be used to carry enough extra gear to get the cabin bag down to the right weight – at least until you’re sure it won’t be checked into the hold (i.e., when you’re on board the plane). Of course being discrete is the key here and so wearing it under a fleece or – in hot climates – a somewhat oversized shirt can go a long way to not bring attention to your sudden gain in weight. Including laptop, my Airport Antidote is 11.5kg against Qatar’s 7kg allowance so I potentially need to shift 4.5kg to my person. Tough, but just about possible. Yes, it is a pain to have to go through this, but there are not really many options. The other thing is to keep the weight of the hold luggage down below the maximum allowed. I’ve been stopped at check-in in the past, but as the hold luggage was under the 23kg maximum the additional weight of the cabin baggage was tolerated. Aim for a size of 55 x 35 x 20cm or less. Aim for a weight of 7kg and, if you can’t, have a plan B for how to deal with the excess weight as you pass through check-in. Do not blindly believe the manufacturers “cabin friendly” label on their web site. It may be an old or different definition to the one your airline uses. In the end there will never really be a guarantee that a cabin bag won’t be checked, but keeping it as small and light as possible certainly helps. For photographer’s the challenge is finding that balance between size, weight and usability. Hopefully this article shows that it is possible to get a significant amount of camera gear into a lowest common denominator size allowance of 55 x 35 x 20cm; that such camera bags do exist and that there are creative options for making cabin baggage temporarily lighter than they actually are.